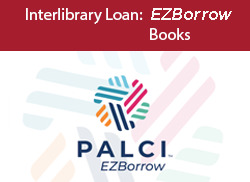 The Library offers two interlibrary loan services. E-ZBorrow is the fastest way to receive books and DVDs. 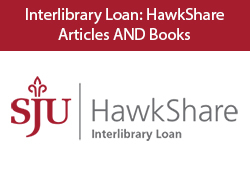 Use HawkShare to request journal articles and book chapters, or books and DVDs that you cannot find in E-ZBorrow. You must be a current student, faculty, or staff member to use these services. There is no charge for these services unless the material is overdue, damaged, or lost. Users will be notified by e-mail when their requested material is available. Required text books, items available at the Library, and ebooks are not permitted to be requested through Interlibrary Loan. Search the Library’s catalog to see if the Library owns the materials you need. Requests are not processed during weekends and holidays. Processing and delivery times will be slower during breaks, vacations, and periods of high demand. Books generally arrive in 3-7 business days. To renew, log into your My Library Account, check the renew checkbox to the left of the item, and click Renew Selected. Articles generally arrive in 3-7 business days. Books generally arrive in 4-8 business days. The active request limit is 20. To renew, contact ill@sju.edu with the title of the item and the request number at least five days before the due date. Under certain conditions specified by law, libraries and archives are authorized to furnish a photocopy or other reproduction. One of these specified conditions is that the photocopy or reproduction is not to be 'used for any purpose other than private study, scholarship, or research.' If a user makes a request for, or later uses, a photocopy or reproduction for purposes in excess of 'fair use,' that user may be liable for copyright infringement. This institution reserves the right to refuse to accept a copying order, if in its judgment, fulfillment of the order would involve violation of copyright law. For information on Copyright issues please refer to the SJU Drexel Library Copyright Policy & Guide.